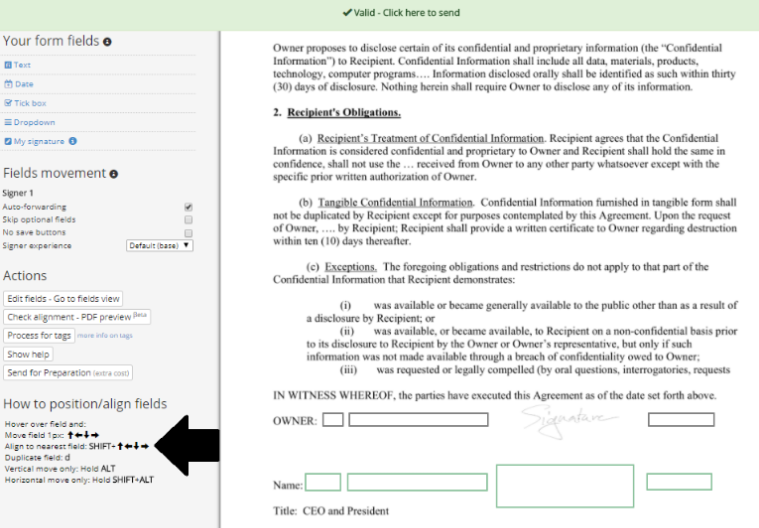 There are three options to position and align sender or signer fields while preparing a PDF on the editing page. Fields can be dragged and dropped onto the PDF, this is the fastest but least accurate way to place fields. Hover over a field and use the arrow keys on your keyboard to move fields already placed on PDF pixel by pixel. Hover over a field and press Shift + (any arrow key) to snap align the field to the next closest field in the direction of the arrow key selected. Snap align will save you a lot of time if you have a list of form fields straight down the page, or directly across the page. This image show you where can find field shortcut information on the PDF edit page. Check out this article with all the tricks on form fields.